If you're like me, you're completely fascinated by makeup palettes. The sheer abundance of choices within each one -- brown eyeshadow or blue? red lipstick or purple? blusher or bronzer? -- especially when combined with the pretty packaging and the cuter-than-cute brushes is enough to make this beauty chick scream with glee! Size truly doesn't matter, either -- I could go for a palette with a hundred different shades or be happy with eight. 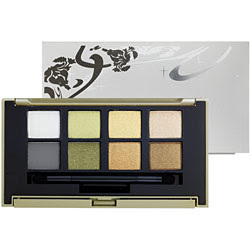 And Sephora must have heard my call, because their latest and greatest -- the Enchanted Eye Palette in Bronze seems like it was made especially for me! It contains eight absolutely gorgeous shades of brown, green and gray, all which seem to complement each other perfectly and would look good on truly any skin tone! Choose from Chrome 01 (pearly white), Pearl 03 (sparkling lime green), Strass 03 (shimmering gold), Pearl 08 (sparkling champagne), Mat 02 (matte grey), Strass 04 (glimmering olive), Strass 05 (glittering bronze) or Kiss From... (sparkle-tinged chocolate). All are held within a simply stunning gold palette with an intricate floral design splashed across the cover. It seems the eyes would have it.